Although the groom and bride exchanging wedding rings on the wedding day is not an Islamic tradition, there are still some couples that choose to do it for the sake of novelty. Some couples also like having an outward symbol of their union together, even though as I have said, this is unnecessary in Islamic culture and tradition. However, if you choose to exchange rings then you should know that today platinum is considered a favored metal for designer wedding bands. It is more durable than gold and most couples today prefer it for a wedding band. However, it is significantly more expensive than gold and is almost twice the price of an 18-ct white gold band. The platinum designer wedding band is elegant and perfect for wedding bands. Should Your Wedding Rings Be of Platinum Or Gold? When considering the style of your wedding rings the metal from which they are made is often one of the most important decisions. There are many aspects to consider. Gold is the most customary choice for wedding rings as it traditionally represents warmth and love, but symbolism aside it has materialistic features to mull over. Gold quality is ranked by carats; 9ct, 18ct, or 24ct. The most pure gold is 24k, but it is also the softest. The reverie of pure gold will soon be lost after the scratches and dents become noticeable in its once untainted glow. Also, the softness of 24ct gold makes the ring more susceptible to weak prongs. To ensure a lasting ring with low maintenance, opt for the 9ct or 18ct gold. A lower percent of gold is worth the assurance that the wedding ring will last the duration of the marriage. Other metals such as platinum, palladium and titanium are becoming a popular choice. If the idea of having even a percentage of the metal in the ring vulnerable to damage is still unnerving, platinum is the only route. Being the strongest metals allows it to retain the symbolism in a more untraditional sense. The strength of the metal parallels the strength of the couple's bond of marriage. Also, the fact that is the strongest metal makes it a smart choice while the appealing sheen makes it an elegant option as well. Another benefit of platinum wedding rings is that they are 100% pure. Because platinum is not mixed with other metals as gold is, it is safe for those who have allergies. The one downfall of platinum is the price. It costs more than gold, but when shopping for wedding rings, the price is second in respect to longevity. Platinum and gold do rule the wedding ring market, but other metals, especially in men's rings, are available. Tungsten is popular due to its lustrous polish and heavy feel. They allow the groom to wear a ring he is proud of while preserving masculinity. Titanium is also gaining notoriety. Like platinum and tungsten, titanium is of high quality and indisputable strength. Of course, aesthetic qualities of the wedding ring will never be forgotten so there are additional points to consider. Many couples feel obligated to have matching wedding and engagement rings. Binding to this misconception that they must match puts restrictions on the limitless selections. Wearing the engagement ring on the right hand and the wedding ring on the left allows for two completely separate styles to shine yet retain their original meaning. Otherwise, if the styles match but the metals conflict, pairing the two together produces a bold statement that draws attention in a chic way. Also, bear in mind what styles and metals of jewelry the bride and groom wear regularly. 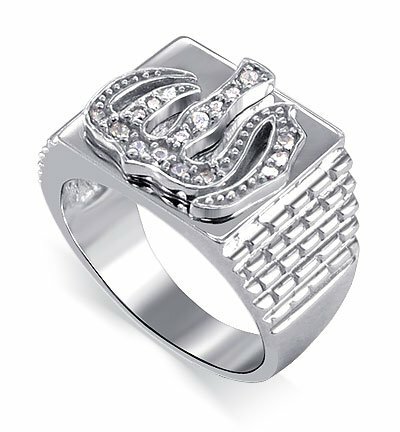 If the bride wears primarily silver jewelry, a silver, platinum, or white gold ring would be the most practical option. Take into account the style of watch that the groom normally wears. Whether the marriage begins with a diamond-encrusted platinum band or an elastic rubber band, the focal point of the wedding is the love between the bride and groom. The symbolism and beauty of the wedding rings come from the love bestowed on them by the new couple, not the market value. Rich Keys writes about fashion and jewelery. If you are planning to buy your wedding rings online, then be sure to visit DiamondGeezer, where there is a wide choice of palladium, yellow and white gold, and platinum rings as well as the ability to design your own wedding ring.